Join us for one last dance here at 166a as we raise funds for those affected by the fire at 702 44th Street. - Come learn how you can save on energy bills while supporting a Just Transition towards green energy! - Renters and homeowners alike no need to install on your own roof, you can co-own solar production while receiving net savings! lease join us for our next ULURP workshop taking place at the Sunset Park Library. 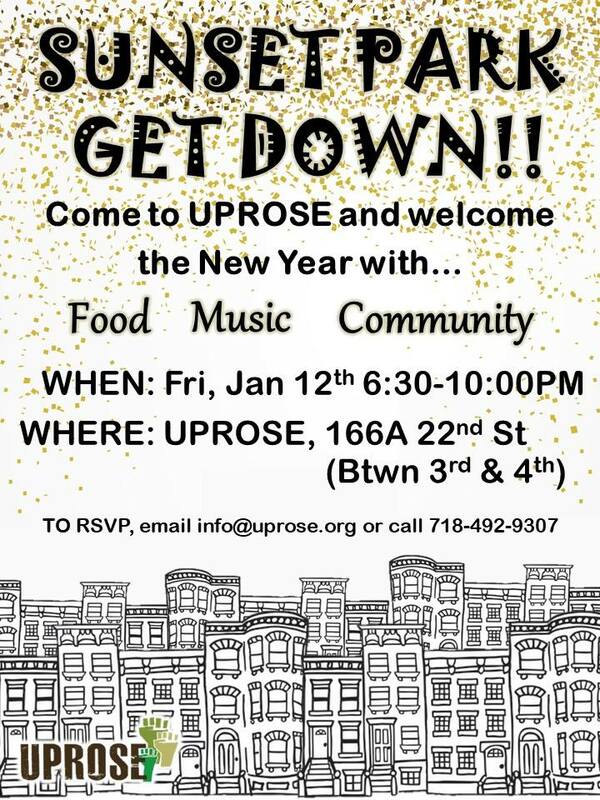 RSVP to info@uprose.org, Spanish interpretation will be provided. Please join us for our next ULURP workshop taking place at the Sunset Park Library. Join us on March 9, 2019, As we screen a film on Housing Justice in the South Bronx. Join us on February 27th, as Sunset Park community members will gather and talk about what the upcoming Climate Justice Convening will look like. Join us on January 31st to learn how local community solar power can serve Sunset Park residents and how you can co-own local solar production, and support a Just Transition! Stay tuned as UPROSE works with several volunteer supporters to plan and stage a fundraiser for sustainable farming in Puerto Rico. Proceeds will be donated to La Finca Conciencia and the Solidarity Bus/La Guagua Solidaria as Puerto Rican communities on the main island of Puerto Rico and the island of Vieques strategize and rebuild to increase sustainable farming and renewable energy reliance and resiliency while helping locals to depend less on US-controlled, imported foods. Details will be published soon. On July 23, Community Board 7 held its first town hall meeting regarding the rezoning proposal put forth by Industry City which would drastically change the last major manufacturing waterfront remaining in New York. UPROSE supporters showed up in strong numbers to silently protest the rezoning which, we affirm, would cause the displacement of local residents by the elite and the replacement of well-paying manufacturing jobs with low-paying service jobs. Instead of working to support their own families, Sunset Park residents face the real threat of having to work for and serve the new elite taking over the waterfront. Sunset Park is NOT a playground for the rich. Sunset Park is not for sale. Our red and black POWWA flags covered the outside sidewalk and stood watch during the town hall meeting. Join us in our fight to preserve local jobs and local residents. Join us to celebrate the community members who dedicated themselves to learning the history of Bomba this past spring--and watch them perform for us! We will also be expanding the party to thank all those #OurPowerPRnyc coalition members who marched with us during the National Puerto Rican Day Parade on Sunday, June 10, 2018. Join us this Juneteenth, June 19th, 2018, in welcoming two powerful leaders from Vieques, the Puerto Rican island off of the eastern section where the US Navy once tested its military might:Ana Elisa Perez Quintero, co-founder of La Colmena-Finca Conciencia, and Myrna Pagan, long-time member of the resistance. Ana Elisa and Myrna will guide us through the challenges Vieques faces and the grassroots solutions their communities lead. Over 170 members of the #OurPowerPRnyc coalition united as one contingent to deliver the message, "El poder lo tenemos nosotros puertorriquenos (Puerto Rican People Have the Power!)". Our contingent included CJA, Muevete, El Maestro Boxing Club and Cultural Center, North Bronx Racial Justice, Tambor Pre-School, NRDC, and CHULO among others. The contingent was led by three youth activists carrying the UPROSE banner. Elizabeth Yeampierre followed in the UPROSE sunflower-decorated, electric car. Alongside the car were two CHULO models looking like royal guards. After this came the first two of the art brigades: the puzzle map of Puerto Rico honoring the living and the over 4500 dead, and the mangrove tree accompanied by an intergenerational collective of kids, teens, young adults and elders carrying paper puppet animals native to Puerto Rico's ecosystem that had #justtransition and #justrecovery messaging on the converse side of the art. Behind the float came the young boxers from El Maestro. Immediately behind them came our third art brigade that showcased a huge Taino/Arahuaco-inspired puppet hurricane whose message was that disaster capitalism and PROMESA were the real hurricane. At the tail end came two banners and dozens of marchers carrying black flag parasols. UPROSE and Global Grassroots Justice Alliance teamed up to present Honduran folk singer, Karla Lara, in the final performance of her US tour. The Sunset Park community near and far gathered at UPROSE for an evening of food, conversation, laughs, and, of course, the powerful and inspiring resistance pieces Karla has been singing for decades in her efforts to showcase the struggles of her indigenous community in Honduras. Jose Antonio Velazquez accompanied her on guitar. Join #OurPowerPRnyc and the Protect Our Working Waterfront Alliance for a Direct Action Training at UPROSE. The training will empower participants with tools necessary to take action and will cover the basics of planning and participating in a Direct Action and how to keep our community members safe! Please note that this training is for participants who have been involved in or are interested in getting involved in the #OurPowerPRnyc (Puerto Rico Just Recovery) or POWWA (Sunset Park Anti-Displacement) campaigns. 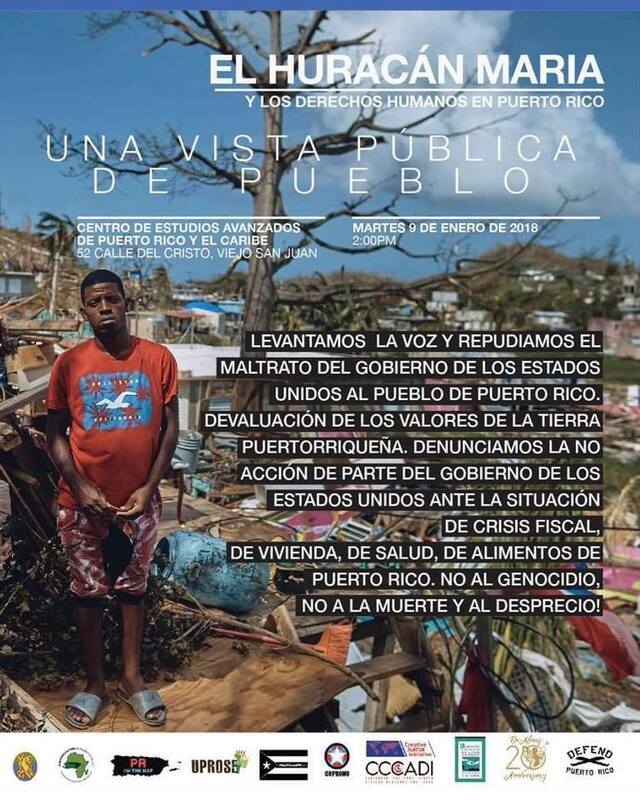 Come join us and the #OurPowerPRnyc coalition as we gather together to create art that will deliver a powerful commentary on the effects disaster capitalism has had on Puerto Rico and its recovery from the hurricanes, Irma, Maria and the biggest one, PROMESA. Food and refreshments will be provided, and your help will help us make sure parade attendees know that Puerto Rico deserves a #justtransition and a #justrecovery. 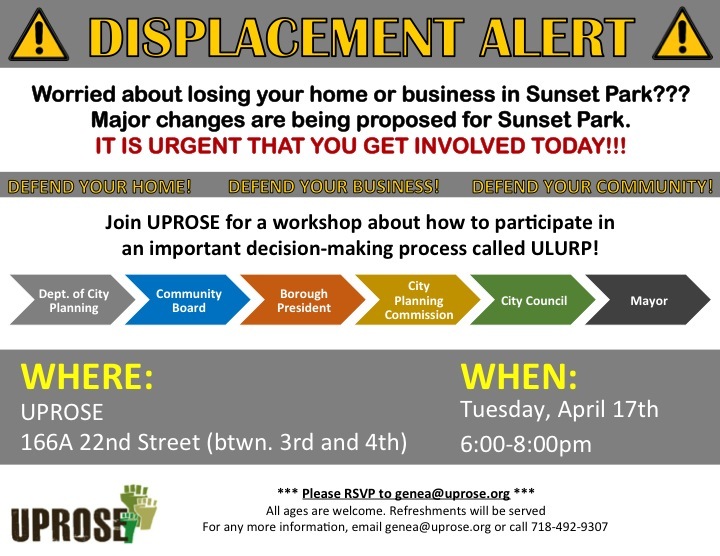 Please join us for our next ULURP Workshop taking place at UPROSE. RSVP to genea@uprose.org | Interpretation in Spanish will be provided. 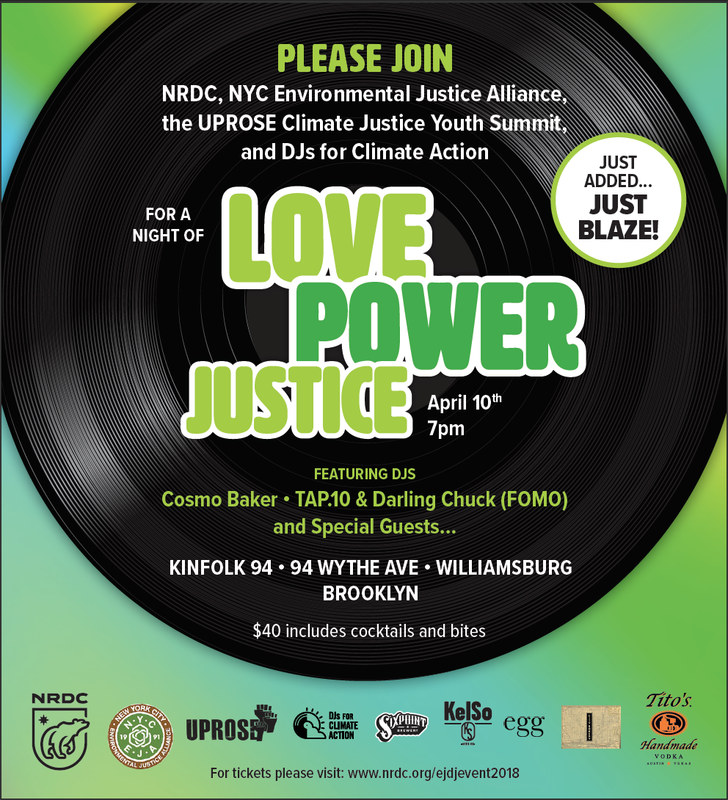 NRDC and DJs for Climate Action are hosting an environmental justice fundraiser! Proceeds will go to the UPROSE Climate Justice Youth Summit, the NYC Environmental Justice Alliance, and NRDC. We hope you can join us! 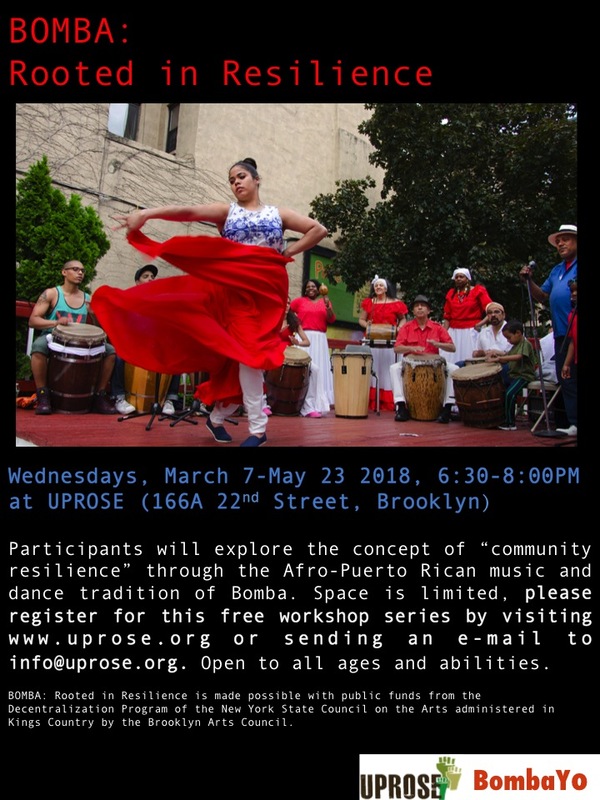 UPROSE is excited to announce that we have received a grant from the Brooklyn Arts Council to partner with BombaYo to provide a free Bomba Workshop series for the Sunset Park community! Through this workshop series, participants will be engaged in a dialogue about “community resilience” through the Afro-Puerto Rican music and dance tradition of Bomba. Please see the flyer for more information and fill out the form below to register. Please note that participants should be able to attend the majority of the 12 workshop sessions which will take place on Wednesdays, March 7th-May 23rd 2018, from 6:30PM-8:00PM. Do you have any accessibility needs? If so, please let us know. Would you like to be added to our mailing list for future events? Please join us for the premiere of a documentary film on the Brooklyn Queens Connector (BQX) streetcar. The film will be followed by a community discussion with the filmmaker. Popcorn will be served! UPROSE’s Climate Justice Youth Summit is the largest gathering of the young people of color on climate change in the country. This year we are partnering with the Climate Justice Alliance, Muevete, the House of Fa Mulan and others while expanding the summit’s from a New York City based event to a national dialogue between youth leaders of color from Flint, Michigan; the Gulf South; Standing Rock; and the Global South. This is a Call to Action! Young people of color are on the frontlines of the climate crisis, now is the time to power up!